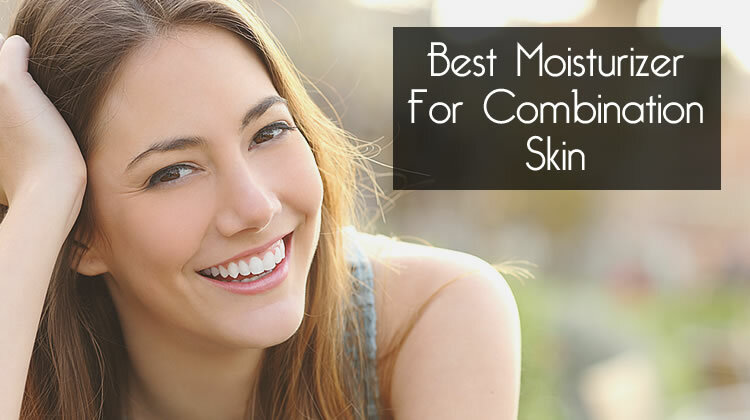 Everyone wants to know what the best moisturizer for combination skin is. Because properly caring for combination skin can be a royal pain in the you know what! Somehow half of your face is acting out a dramatic play based in the Sahara Desert, while the other half is whitewater rafting down the Rocky Mountains. Combination skin is notorious for having a fierce split personality. It seems cruel to have to deal with greasy, oily breakouts AND dry, flakey patches all at the same time. Combination skin is very common and often considered the most prevalent of all the skin types. 1. How does your skin feel on any given day? Combination skin typically produces an oily T-zone (which includes your forehead, nose, and chin), while the rest of your face feels dry. It doesn’t have to be these exact locations, but if you feel 2+ textures then you more than likely have combination skin. 2. What do your pores look like? The pores on combination skin are usually larger, more visible, and clogged around the nose. Pores on the cheeks and remaining parts of the face are small and rather unnoticed. 3. How does your skin feel after cleansing? Combination skin will normally feel refreshed, clean, and oil-free around the nose but the cheeks and surrounding area are left feeling dry and tight. 4. How often do you need to moisturize? Moisturizer is usually frequently needed on the cheeks and under the eyes, while the oily T-zone rarely needs it. If those 4 answers describe your skin, then welcome to the Combination Skin Club. We’re here to help you properly moisturize your skin by keeping both sides of the spectrum happy. Alcohol has a knack for showing up in various moisturizing products. It’s tempting to use alcohol on combination skin because you may get temporary relief from your oily T-zone. However, alcohol can dry out the rest of your face, particularly the sensitive areas around your cheeks and eyes and strip them of their natural oils. This stimulates an increase in oil production in order to make up for the moisture loss and balance the skin. Avoid harsh, drying ingredients such as Specially Denatured (SD) Alcohol and Isopropyl Alcohol. Sulfates are aggressive detergents used in various skin and hair products. They can strip the natural oils off skin, leaving it inflamed and irritated. Just as with alcohols, sulfates disrupt the delicate oil and moisture balance in our skin. This leads to overly dry, flaky patches on our cheeks and eye areas. It also causes an overproduction of oil, which makes for an even greasier T-zone. Since combination skin includes various skin types, you may find that certain ingredients pertain better to your personal skin type. AHAs are exfoliators that evenly and gently shed dead skin cells from the outermost layer. By doing so, they smooth out rough patches and promote healthy, hydrated skin. This makes them perfect for lightly exfoliating the dry areas associated with combination skin such as around the cheeks. Alpha Hydroxy Acids are water-soluble and work best on normal to dry, sun-damaged skin. They work to boost the skin’s natural moisturizing factors. Just like AHA, BHA works on the surface of the skin to exfoliate the outermost layer of dead skin cells. However, it’s able to reach deep into the pores where it can remove excess sebum (oil). This makes it a unique, powerful acne-fighting ingredient. It also helps reduce the appearance of fine lines, wrinkles, rough patches, and uneven skin tones. BHA is oil soluble and works best on normal to oily, acne prone skin. It can help clear oily, clogged pores, such as those in the T-zone, and reduce the overall size of pores. Hazelnut Oil addresses all factors of combination skin. It works to absorb and balance oily areas (like that in the T-zone), while the healthy fats in the oil hydrate, moisturize, and soften the dry areas (such as around the cheeks). It’s a “dry” oil that isn’t heavy or greasy, so it doesn’t clog pores. The properties in it reduce the appearance of large pores and wrinkles. It’s gentle and doesn’t irritate skin. The antioxidants, nutrients, and flavonoids help protect the skin from environmental stressors and promote radiant, youthful skin. Sunflower Oil is another great ingredient that benefits both sides of combination skin. This oil has natural calming and moisture retaining properties. It’s loaded with powerful antioxidants and nutrients that help reduce redness, inflammation, acne, irritation, and even eczema. It has carotenoids and vitamins D, A, and C that act as a shield for the skin, protecting it from harmful substances. The fatty acids and vitamins give it regenerative skin cell properties. It’s also easily absorbed and doesn’t clog pores. Argan Oil is incredibly versatile for various skin types, like that of combination skin. This oil contains sterolins, which help the skin retain moisture and encourage the metabolism of healthy skin cells. The unsaturated fatty acids promote supple, soft skin. Argan oil regulates the production of oil and in turn decreases the likelihood of acne breakouts. The antioxidants in vitamin E work to remove damaged skin cells and promote the growth of new cells. Argan oil hydrates dry areas and helps soothe itchy, flakey skin. This unique oil is harvested from the seeds of rose bushes and aids the skin in multiple ways. It’s rich in vital nutrients, antioxidants, essential fatty acids, and vitamins that hydrate itchy, dry skin and lessen the appearance of fine lines, dark spots, and scars. The antioxidants in vitamins C, D, E, and B-carotene protect the skin, promote cell turnover, and fight off free radicals. Rosehip oil is deeply moisturizing and helps treat irritation and redness. This oil is extracted from the seeds of evening primrose, a small flowering plant. Like all of the previous ingredients listed, evening primrose oil offers up a variety of skin benefits. It helps with acne by decreasing inflammation, shrinking the overall size of pimples, and boosting the healing process. This oil also helps prevent the occurrence of acne scarring. The essential fatty acids nourish the skin, leaving it soft and supple. It’s also a low-comedogenic moisturizer, meaning it’s less likely to clog pores and cause breakouts. All of these are important factors for combination skin. Combination skin is a bit complex. Frequently, individual’s experience multiple skin textures and issues at once. The T-zone (forehead, nose, and chin) is oily and acne prone. Whereas other areas, such as the cheeks and under the eyes, are dry, sensitive, and sometimes flakey. This requires a bit more thought when choosing the best moisturizer. It needs to help manage oil and acne, while hydrating and soothing dry skin. The 7 ingredients discussed are versatile and provide multiple benefits for the convoluted combination complexion. Be mindful of those ingredients when you’re looking for your particular moisturizer. For great ideas on the best moisturizers for combination skin, check out our list of the 10 best face moisturizers.